We welcomed back Al Globus for this two segment 2 hour 15 minute discussion enhanced with calls and participation by his co-author, Tom Marotta. We started the first segment with Al introducing us to his eLEO (equatorial LEO) space station orbit for low radiation, a minimal amount of shielding needed, and spin rates that could be used to provide artificial gravity for the station inhabitants. Al spent a good part of the first segment explaining the rational and supporting facts behind his eLEO station, plus he talked about the chapters and structure of the available ebook authored by both Tom Marotta and Al, "The High Frontier: An Easier Way." Listen carefully to this discussion because it provided the foundation for later listener questions and a quality Q&A with Al and Tom when Tom was on the toll free line. Space settlement was a primary focus of our discussion as the eLEO station Al and Tom were proposing was about space settlement. 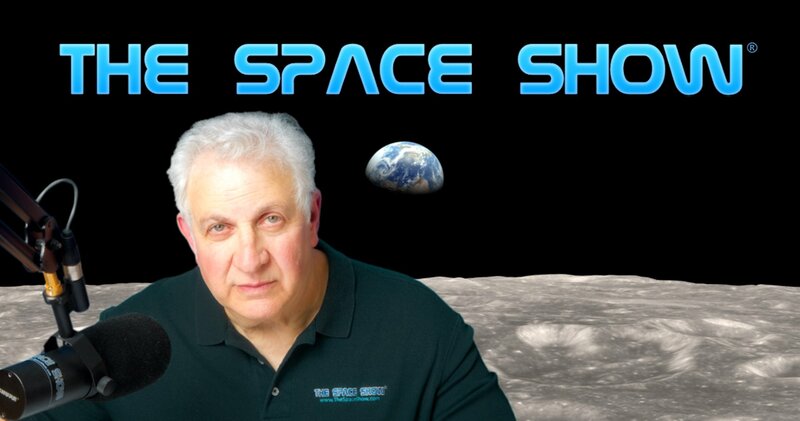 This will become clear in the second segment as a listener asked Al and Tom about NASA, Congress, and any official position regarding space settlement. Also, later Al and Tom were asked about marketing their eLEO station concept to the existing three commercial space station companies but more on that later in the summary. Both Al and Tom address critical needs in the space transportation industry/segment as lower space access costs by many magnitudes were still needed to close a business case for the eLEO station. Al repeated this multiple times during our program, especially when asked about timelines. Also mentioned in the timeline discussion was the use of space hotels and how they could contribute to the demand for the station and space settlement. Mark in Petaluma called to talk about station rotation orientation in orbit. Don't miss this discussion. Space tourism at the eLEO station was discussed as was space solar power (SSP) as a driver with lower launch costs. Al talked about running numbers for analysis but he did say they were optimistic numbers at this time. The work by Dr. Zubrin was also referenced. One key additional topic brought up in the first segment was food for the eLEO residents, space agriculture, and related matters. Marshall was our first caller of the second segment with the topic of space farming. Marshall had suggestions, including the idea of a totally separate farming space station. Al suggested new technology and developments would be far more efficient so it was unlikely a separate farming station would be needed. Don't miss how Al described space farming and agriculture to support the eLEO station. I joked around with Al in that the menu did not seem very appealing lacking beef, chicken, and such. That said, getting cows to eLEO was not part of the equation, at least not yet. Al pointed out that in his ebook there was a proposed menu that readers can examine. Carol sent in an email asking about our space policy and Congress not mandating NASA to focus on space settlement. Al talked about this matter in some detail with Tom calling in to add to the discussion. Don't miss this as it was an important discussion. Hint: Not the space settlement enabling technologies that NASA can and is implementing in their R&D human spaceflight programming. Al said he preferred the old NACA model for NASA. Listen to what he said and let us know what you think by posting on the blog. The next discussion topic focused on cheaper space transportation. Some of this focused on the BFR, Falcon Heavy and the Dragon. I asked both Al and Tom what was meant by lower cost. The number that was proposed was about $1 million per person. Don't miss this discussion. As the program was nearing an end, we got an email from Jim in Tucson asking if a space force would be necessary with citizens living on an eLEO station. Both Al and Tom did not support the space force but listen to their comments as they had much to say on the topic. Will got in a last minute email (I thought it would be last minute) asking about the eLEO station being independent. Our two guests had much to say on this topic so don't miss it. As I was closing down the program, we took a last minute phone call from Tim who likes to call when the show is ending. Tim wanted to know about possible alternative access options to rockets for getting people off Earth. This was discussed by Al so don't miss what he said. Tim had a few remaining questions so don't miss the full conversation. After the call from Tim, I took an 11th hour email from Paul asking about the possibility of shifts in the Earth's magnetic field rendering the eLEO orbit useless or near useless for low radiation. Al said if the poles did shift and the orbit had radiation needing shield, the concept would not work. Again, he talked at length about his idea not yet being able to close a business case but he thought soon that might change with the continued lowering of rocket launch costs. As for the magnetic field issue, both Al and Tom (via email) said that now was a window of opportunity to do the eLEO station because at some point in the future the window might close. Al pointed us to a paper in the NSS Journal of Space Settlement addressing this problem. The paper in question, written by Dr. Phil Chapman (Al later corrected the name of the author as initially he said it was authored by someone else) was posted on the blog by Tom and I encourage all of you to read it. I did read Phil's paper after the show and was impressed by it. Phil used to be a regular guest many years ago on TSS so I have reached out to him to return as a guest to discuss this paper. I am optimistic that Phil will return and I hope he does. In the meantime, do read his paper which Tom posted for us on the blog. Our final call (yes, we kept getting them) was from Jon in Redding, CA. I asked Jon for a fire report re the huge CARR Fire in Redding. After that, our caller wanted to know about restaurants with decent food in the hotels for the tourists. I applauded Jon's sentiments for good food based on the food discussions earlier in the show. Then I joked that maybe Mr. Bezos would have Blue Origin deliver high quality food to the eLEO station from Whole Foods. Be optimistic everyone. Al offered us good closing comments. Don't miss them. Please post your comments/questions on TSS blog for this show. You can reach Al through NSS or me. Tom can be reached through me.